- are you there yet? POST NATYAM, USA present "Meet The Goddess"
"The ideals of femininity-mother, consort, and warrior, crumble and real women emerge from their ashes. Meet the Goddess investigates the multifaceted relationship real women have to the imagery of the goddess as both an impossible ideal, and also a vision of strength and female empowerment. Through South Asian dance forms (Bharata Natyam, Kuchipudi, and Charya Nritya), contemporary dance, and video, the show critically dissects issues including domestication, sexuality, motherhood, and objectification." 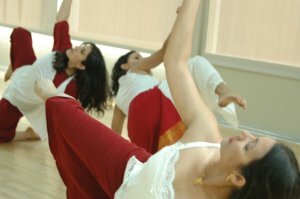 The Post Natyam Collective, a multinational collective of independent choreographers and scholars, explores contemporary Indian dance, performance and video on a continuum of tradition and innovation, theory and aesthetics, art and activism. The collective currently consists of Sandra Chatterjee (Germany/India), Shyamala Moorty (USA), Anjali Tata (USA) and Sangita Shresthova (Nepal/Czech Republic). 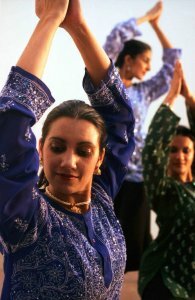 The four met during their graduate studies at the Department of World Arts and Cultures at the University of California, Los Angeles. 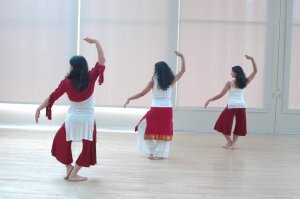 The collective members use their diverse artistic backgrounds, which include training in Bharata Natyam, Kuchipudi, Kalari Payattu Modern/Postmodern dance, Polynesian dance, Yoga, theater, and video to create thought provoking performances, workshops and lectures that address contemporary issues facing women with transnational identities (South Asian, American, and European).